Perception of vision is the most important sense and all of us communicate through our surroundings through optic senses. The eye is one of the important sense organs that are able to detect light from the surrounding environment, navigate and transfer necessary information to the brain. It is a very complex organ made up of multiple, specialized components, or tissues, which are made up of many types of cells each has specific function to perform. If any of them become aberrant or non functional it leads to problem of insight that is also known as vision loss. Vision loss occurs due to trauma, multiple sclerosis or vascular disorders. Visual impairment severely affects person’s life and behavior of his/her family members with a deep socio-economic impact. There are several reasons of loss of vision in human but many of these disorders cause blindness are genetically inherited. There are numerous birth related genetic defects and environment induced eye defects which cause vision loss in human being in all age groups. There are series of neuronal-eye problems such as retinitis pigmentosa (RP), in which progressive loss of photoreceptors and retinal pigment epithelium occurs. Progressive multiple sclerosis is associated with metabolic failure of the axon and excito-toxicity that leads to chronic neuro-degeneration. Other important eye defects are glial scarring, fibrosis, glaucoma, myelin sheath destruction of corneal sensory and ciliary nerves and of the optic nerve. Other eye defects are non-glaucomatous optic neuropathies, corneal clouding, ocular hypertension, and glaucoma and optic nerve atrophy. Visual impairment in human eye is also occurred due to accumulation of ‘ceroid-lipofuscin’ in surface conjunctival cells, and in ganglion and neuronal cells. Few important known eye defects are Stargardt’s disease, Leber’s congenital amaurosis and optic nerve diseases and degeneration of retinal ganglion cells (RGCs), found both in new born and adults (Figure 1). A variety of diseases occur due to non functional axons within the optic nerve that result in loss of visual function. Traumatic optic nerve (ON) injury is the leading cause of irreversible visual impairment worldwide. 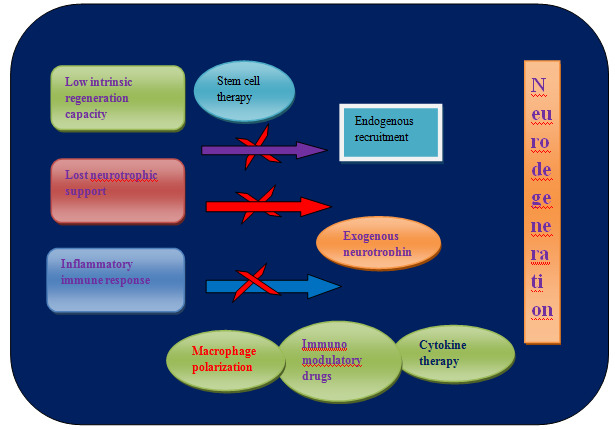 Figure 1: Showing overcoming factors leading to neuro-degeneration. Optic nerve disorders severely impact vision in one or both eyes. These lead to various pathologies due to intraorbital, intracranial, intrinsic, or systemic disorders. Optic nerve diseases could also lead to life- and vision-threatening conditions. Usually, optic nerve contains about a million of small nerve fibers that carry images of what the eye sees to the brain. As nerve fibers become damaged, brain stops receiving vision information in proper way and eyes sight becomes blurred. Retina, which senses light and transmits impulses to the optic nerve contains small photoreceptor cells. This optic nerve from each eye carries these impulses to the brain, where visual information is interpreted and realizes a true vision. Loss of vision happens when there is any damage to an optic nerve or damage to its pathways to the brain. Damage to an eye or the visual pathway causes different types of vision loss depending on where the damage occurs. Optic nerve hypoplasia or Nerve atrophy or ischemic condition leads to vision impairment. This is also known as opticatrophy and optic neuropathy (Figure 2). 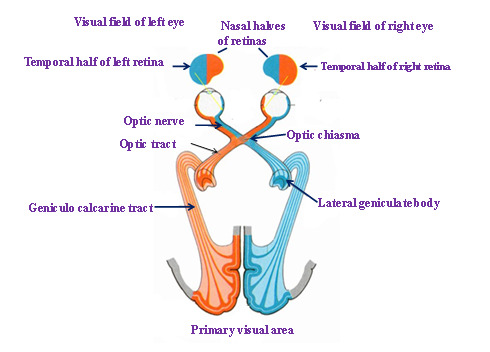 Figure 2: Showing optic tract and primary visual path with neuronal network system. Neural loss from the optic nerve occurs due to environmental stress, and physiological defects. This is a frequently occurring, irreversible blinding pathology that involves optic light-sensing tissue. Similar to the brain, the eye, which is a part of the central nervous system, will not be able to restore neuron loss after the occurrence of disease. The patterns of optic nerve diseases provide information to the researcher to help understand the fundamental pathological activity and establish a method to enhance advanced detection and treatment strategies. It is hoped that the primary outcome of reducing degeneration of the optic nerve will also lead to the improvement in visual function and decreased intracranial hypertension. Retinal diseases also cause problems to the eyes; these include retinal detachment and retinal vascular complications. Retinal detachment is a medical condition in which the retina separates from the back of the eye. Macula-off retinal detachment can be treated by using modern surgical techniques, such as scleral buckling, pneumatic retinopexy, and pars plana vitrectomy, we can anticipate more than a 90% success rate for anatomical repair. Bone marrow-derived autologous cells are used for treatment of optic nerve diseases (Table 1). Table 1: Showing various neuro-optical eye defects and therapeutic measures. Scleritis Inflammation of the sclera Red eyeball, pain, watering eyes Corticosteroid eye drops to help reduce the inflammation. Eye components mainly photoreceptors and neurons transfer signals to the brain for processing. For better functioning of eye constant renewal of cells and neo-vascularization process remain continue. The most common pathologies responsible for visual impairment and blindness are age-related macular degeneration, glaucoma and diabetic retinopathy. Major eye diseases which result in loss of vision or blindness are age-related macular degeneration (ARMD), diabetic retinopathy, cataracts, and glaucoma[12-14]. There are general causes of sudden loss of vision i.e. clouding of normally transparent eye structures, abnormalities of the retina, obstruction of visual signals due to abnormalities of the optic nerves which transfer information from eye to the brain. Few of them are genetically linked and associated with multiple risk factors including diet, hypertension, pregnancy, and smoking. The sudden loss of vision also occurs due to blockage of a major artery of the retina, artery to the optic nerve, major vein in the retina, jelly-like vitreous humor near the back of the eye and eye injury. Atherosclerosis also causes sudden retinal blockage. Blockage of artery to the optic nerve also occurs due to atherosclerosis and causes severe inflammation. A blood clot in the retinal vein also block vision in old age. High blood pressure affects vision and diabetic people also remain at risk of bleeding into the vitreous humor. Viral or protozaon infection inflames the retina, and bleeding within the retina as a complication of age-related macular degeneration. Stroke or transient ischemic attack (TIA), acute glaucoma, retinal detachment cause heavy inflammation and generate optic neuropathies (Table 1). Optic nerve atrophy leads to vision impairment optic-neuronal degenerative and genetic diseases which are seen in patients. Eye defect also occurs due to imperfect focusing of light rays on the retina that cannot be fully corrected with eyeglasses or contact lenses. Anything that blocks the passage of light from the environment to the back of the eye or disrupts the transmission of nerve impulses from the back of the eye to the brain will interfere with vision. There is possibility that light cannot reach the retina due to complete blindness that occurs in special circumstances i.e. cornea is attacked by herpes kerato-conjunctivitis, or kerato-malacia due to vitamin A deficiency. It causes dry eyes and result in an open scar or formation of cataract, which causes loss of clarity of the lens. Most severe problem is loss of neurons, production of an impenetrable glial scar and loss of key supporting cells called oligodendrocytes. Narcolepsy is a chronic sleep disorder, characterized by excessive daytime sleepiness (EDS), cataplexy, sleep paralysis and hypnagogic hallucinations. Large majority of human narcolepsy patients are ligand deficient, hypocretin replacement therapy may be a promising new therapeutic option, immune-mediated neurological disorders, such as Guillain-Barre syndrome, MA2-positive paraneoplastic syndrome and neuromyelitis optica (NMO)-related Disorder. Spontaneous orbital hemorrhage is a rare but sight threatening incident. Blindness or loss of visual function can be caused by failure of the light path to reach the retina or failure of the retina to capture and convert light to an electrochemical signal before transmission to the brain via optic nerve. The occurrences of these pathologies increase with the age of the patient and are thus widely spread among aging populations. Blindness is an extensive disease that not only affects the quality of life of the patients themselves but may have a negative impact on the socio-economic status of their immediate families[23,24]. Reparative processes such as gliosis and fibrosis also can make it difficult to replenish and regenerate neurons. For restoration of vision various methods are used to protect visual impairment visual impairment by early diagnosis followed by surgery, ionizing radiation, laser, or drug treatments[26-28]. Despite the efficiencies of these treatment modalities, they do not provide a complete solution to stop the progression to blindness. Stem cells obtained from various sources show the capacity to revive degenerated cells or replace cells in many major diseases including ocular disorders[29-32]. Despite the defects found in visual cells and nerve cells, neurons such as bipolar cells and ganglion cells still remain alive even in the retina of patients. These can be restored by replacement of dead photoreceptor cells with something artificial/natural retinal cells (Figure 3). The remaining retinal neurons can be stimulated by either electric current or electric potential. Photodiode array and electrode array are two main ways to stimulate retinal neurons as retinal prostheses. These retinal prostheses have problems such as low sensitivity and requiring outer electric sources (batteries) (As illustrated in: Table 1). Figure 3: Showing primary and secondary factors responsible for optic nerve degeneration. Cell replacement therapies are used to restore eye visual function and retinal repair. This is a mainstream medicine that has many therapeutic benefits. Cell transplantation into damaged or diseased CNS tissues is a promising approach to treating various neurodegenerative disorders. Transplantation of photoreceptors or retinal pigment epithelium cells derived from human ES cells can restore some visual function. Though there are problems of differentiation and integration of the transplanted cells. Induced pluripotent stem cells (iPSCs) are recommended for retinal cell replacement therapy. These are good therapeutic tool to treat an individual patient who so ever in need. These are generated in laboratory and banked from select donors. The application of ES cells that has received the most attention in recent years is as a novel source of cells for cell replacement therapy for the treatment of a wide range of debilitating diseases. A number of approaches are used to tackle with visual neuronal disorders. Neural and mesenchymal stem cells secrete growth factors which provide neuroprotective effects, reducing loss of retinal ganglion cells (RGCs). These are used to replace RGCs to reform functional connections between the eye and the brain. But RGCs required upregulated c-jun expression if not maintained neural tissues become weak, defective or finally die. Cell replacement is a novel therapeutic approach to restore visual capabilities to the degenerated adult neural retina and represents an emerging field of regenerative neuro-therapy. This is used for restoration and repair of retinal pigment epithelium (RPE) in age-related macular degeneration. It is used to replace lost photoreceptors affected by retinitis pigmentosa. ES cells are used to re-growth and/or repair of damaged cells mainly neurons. ES cell system possesses unique ability to remove dysfunction and loss of retinal neurons. ES population of proliferative cells is used to harness endogenous retinal stem cells for retinal repair. Furthermore, reprogramming of differentiated somatic cells convert ES cells into pluripotent state which show wider therapeutic potential and are used for the treatment of major retinal diseases. For repairing retinal defects differentiating stem cells are used for therapeutic application. Replacement therapies utilize cell-derived retinal pigment epithelial (RPE) cells to supplant lost or defective host RPE cells. Retinal ganglion replacement therapy is used for developing eye like structures differentiated from ES cells. In cell therapy, cellular material is injected into defective organ system of patient. For example, T cells capable of fighting cancer cells via cell-mediated immunity may be injected in the course of immunotherapy. It is used for both neuroprotective and regenerative purposes. Induced stem cells are used for successful transplantation-based strategies for neuroprotection, replacement, and regeneration of the optic nerve. Similarly, macro-autophagy is also promoted for destruction of damaged cell for ocular health. It continually destroys aged or damaged cellular material by lysosomal degradation and recycling. In response to an inflammatory stimulus photoreceptor cells secrete cytokines but tear protein lacritin transiently accelerates flux to restore homeostasis by nullifying the activity of inflammatory cytokines. However, to protect the cellular layers of optic tissues and surface healing regenerative medicine based on stem cell therapy is found suitable. However, for finding safe therapeutic solutions endogenous stem cells have been identified in the eye. Selected batches of stem cells are used to repair the damaged trabecular meshwork and restore functional regulation of aqueous outflow. Thus living cells are injected into the defective part of the eye. More specifically, neural and mesenchymal stem cells which secrete growth factors show neuroprotective effects. These cells reduce loss of retinal ganglion cells (RGCs) in animal models. RGC diseases occurred due to mass cell death, e.g. glaucoma, often lead to permanent damage since mammalian nerves do not regenerate. Similarly, repair of the degenerate retina can be done by photoreceptor transplantation or by administering appropriate, tailored manipulations of the recipient environment. Non-glaucomatous optic neuropathies are mostly seen in patients showing vitamin B12 deficiency and it was correlated with plasma vitamin B12 levels. Similarly, for treatment of gliosis intravitreal bone marrow mesenchymal stem cell (BM-MSCs) transplantation is done. It successfully controls gliosis-mediated retinal folding, up-regulation of intermediate filaments, and recruitment of macrophages. Stem cell therapies are extensively used in treatments for degenerative eye disease. These are used to replace lost neurons and restoration of neural circuits. These cells found in all tissues in our body and are self-renewable and capable of maintaining a certain level of differentiation in response to injury for tissue repair[19-21]. These can act as a source of new, healthy specialized cells and may provide a way to replace damaged cells in the eye. There are several types of stem cells that could be used in different ways, depending upon the particular disorder to be treated. Stem cells present in the optic nerve of many animals overcome these problems to carry out repair and regeneration but in mammals like mice or humans these CNS stem cells are inhibited and remain dormant after injury. Injecting stem cells into damaged spinal nerve tracts that closely resemble the optic nerve improves function in mice. Normally, stem cell progenitors reside in different regions in the eye, during eye development can be used as alternative sources for regaining lost vision. Stem cells present in the region of the eye can renew and repair the damaged parts. Umbilical Cord Mesenchymal Stem Cells are such cells which can differentiate into nerve cells, neovascularize (formation of blood vessels) and immunomodulate when injected into the affected area. These stem cells activate/differentiate local stem cells and other biological pathways by chemokine activities to form new or repair optic nerve cells through regeneration. However, for generation of new optic cells embryonic or fetal tissue is used. Embryonic stem cells and germline cells could develop into neural lineage and multiplied to provide the appropriate number of cells required for repairing of degenerated part of eye. Further, stem cell differentiation needs secreting protective factors to promote survival. More often, retinal progenitor phenotypes induced from embryonic stem cells/induced pluripotent stem cells (ESCs/iPSCs) and endogenous retinal stem cells are used to replace lost photoreceptors and retinal pigment epithelial (RPE) cells and restore vision in the diseased eye. NSCs possess potential as both a source of replacement cells and also as mediators of paracrine treatment. Mainly in paracrine-mediated therapies stem cell-derived trophic factors protect compromised endogenous retinal neurons from death and induce the growth of new connections. ESCs/iPSCs have the potential to replace lost retinal cells, whereas MSC may be a useful source of paracrine because they provide trophic support, repair and assist in replacement of retinal neurons. Furthermore, treatment of injured retinal ganglion cells (RGCs) can be done by using non-retinal-derived adult stem cells, in particular neural stem cells (NSCs) because these protect RGC and stimulate regeneration of their axons in the optic nerve in degenerate eye disease. Human embryonic stem cell (hESC) and induced pluripotent stem cell (iPSC)-derived RPE are used in transplantation therapies. These cells are extensively used in retinal repair. Similarly, adult human peripheral blood mononuclear cells hPBMCs are also used for cell replacement therapy to treat retinal degenerative diseases mainly glaucoma and other optic nerve diseases. MSCs promote re-growth by secreting many immunomodulatory and neurotrophic factors in vitro, including TGFbeta1, CNTF, NT-3 and BDNF. All these play important role in neuroprotection. hUCB-derived MSCs cells also contribute neural repair through rescue and regeneration of injured neurons. More specifically, human umbilical cord blood (hUCB)-derived mesenchymal stromal cells (MSCs) protects and promotes regeneration of axotomised neurons within the rat optic system. These cells are neuroprotective and promote regeneration in a rat optic tract model. Retinal ganglion cells (RGCs) degenerate in diseases like glaucoma and are not replaced in adult mammals. Transplanted RGCs acquire the general morphology of endogenous RGCs, and work with axons orienting towards the optic nerve head. These form dendrites which grow further and from inner plexiform layer. Thus barrier replacement in lost neurons is important to treat retinal and optic nerve disease. Furthermore, both retinal and optic nerve changes are restored by providing high-dose chemotherapy (HDC) followed by autologous hematopoietic progenitor cell support (AHPCS). MSC derived from bone marrow (BMSC), adipose tissues (ADSC) and dental pulp (DPSC), together with ESC/iPSC and discuss and compare their potential advantages as therapies designed to provide trophic support, repair and replacement of retinal neurons, RPE and glia in degenerative retinal diseases. Retinal ganglion cells (RGCs) represent an essential neuronal cell type for vision. These cells receive inputs from light-sensing photoreceptors via retinal inter-neurons and then relay these signals to the brain for further processing. RGC diseases that result in cell death, e.g. glaucoma, often lead to permanent damage since mammalian nerves do not regenerate. Stem cell differentiation can generate cells needed for replacement or can be used to generate cells capable of secreting protective factors to promote survival. Human Embryonic Stem Cells (hESC) are used as important resource to obtain any differentiated cell type of the human body. These cells are also used for development of lens and its regeneration. These cells differentiate to form human trabecular meshwork stem cell network which is used in therapeutics of glaucoma. Umbilical cord blood mesenchymal stem cells are also used for transplantation purpose to replace injured corneal endothelium. These cells behave like human corneal endothelial cells (HCEC) and show ability to heal ex vivo corneal wounds. These cells are used to replace damaged or diseased corneal endothelium but cell transplantation needs specific micro-environmental conditions for repairing and wound healing. Human mesenchymal stem cells also differentiate into soft tissues mainly photoreceptor cells while embryonic stem (ES) cell s could derive neural retinal lineage cells which can be used to form retinal pigment epithelial (RPE) cells and lens cells. No doubt embryonic stem cells become an important resource which can provide a limitless supply of any differentiated cell type of the human body. Umbilical cord blood (UCB) contains stem cells, which have been widely used as a hematopoietic source and are considered best candidate for therapeutic potential for neurological impairment (Table 1). The use of mesenchymal stem cells (MSCs) in cell therapy in regenerative medicine has great potential, particularly in the treatment of nerve injury. Mesenchymal stem cells are multipotent cells which are found in various tissues. These are non-hemopoietic cells, self-renewable which can be isolated and expanded in vitro conditions and trans-differentiate into other type of cells. These cells reside in bone marrow (BM), support homing of hematopoietic stem cells (HSCs) and self-renewal in the BM. These cells are used for repairing of tissues/cells (essentially those originating from mesoderm). These cells indirectly assist in modulating inflammatory and immune responses and used for treatment of various pathological conditions specially for corneal reconstruction. Mesenchymal stem cells obtained from diverse tissues show immunosuppressive and pro-anti-inflammatory characteristics. MSCs are immune-modulatory, multipotent and fast proliferating and possess unique capabilities to restore neurological disorder. These cells then integrate into the site of injury, replacing damaged tissue, and thus facilitate improved function of the organ or tissue. Human NCCs (hNCCs) derived from human pluripotent stem cells (hPSCs) are embryonic migratory cell population. These cells showed the ability to differentiate into a wide variety of cell types and also exhibit neurogenic potential. Similarly, adipose-derived mesenchymal stem cells (ADMSCs) differentiate into corneal epithelium-like cells after transfection with Pax6 gene. These become a good source of generating corneal epithelium-like cells for construction of tissue engineered cornea. Stem cell population found in corneal stroma is used for surgical treatment of fungal keratitis. More specifically, visual cells and retina are formed by an ancestral neural circuit that works under a conserved network of genes (including Pax6/eyeless). These genes create differences in morphology and structure of photoreceptor-type usage and lens. Human adipose-derived cells (hASCs) found overlaid on scleral contact lens (SCL) act as carrier and proliferate to finish ocular alkaline burn. Human umbilical cord blood mononuclear cells and chorionic plate-derived mesenchymal stem cells promote axon survival in a rat model of optic nerve crush injury. Neural stem cells (NSCs) have therapeutic applications, and are used for therapeutics of neurological disorders. Retinal degeneration and damaged photoreceptor can be replaced by transplantation of stem cells. Stem and progenitor cells can be isolated from a number of sources including embryonic tissue, adult brain and even the retina. These can be used to generate photoreceptors for transplantation. A population of rat neural stem and precursor cells derived from rat embryonic spinal cord is used to protect injured neurons in the rat central nervous system (CNS) (Figure 1). Rat neurosphere cells protect axotomized rat retinal ganglion cells and facilitate their regeneration. Regeneration become successful secretion transplanted stem cell populations’ start secreting of neurotrophic factors that could promote cellular differentiation. For treatment of neurodegenerative diseases is only possible by selective replacement of cells. Vision engineering--photoelectric dye-based retinal prostheses could be more useful for patients facing retinitis pigmentosa. Gene replacement therapy is also applied for treatment of neural degeneration diseases. This therapy is used for longterm rescue of a photoreceptor-specific defect or a rapid photoreceptor degeneration caused by mutation in genes participate in eye development. By using gene therapy both rods and cones can be successfully restored with a single photoreceptor-specific promoter. Generally, in man neural ectoderm, surface ectoderm, ecto-mesenchymal/cranial neural crest cell, and modicum of mesenchymal tissues form optic vesicles, photoreceptors and nerve cells in presence of active genes. Two genes OCT4-pg1 retrogene and NANOG play important role in self-renewal and differentiation of pluripotent cells in a developing eye. A third gene Pitx3 maintains lens epithelial phenotype and prevents inappropriate fibre cell differentiation during lens development. Pax6 is a homeobox gene that participates in eye development[75-78]. Along with Pax6, the other associated genes which are co-partner in eye development are Rx/Rax, Pax2, Lhx2, Mitf, Otx2, Sox2, Six3, Pitx, Vsx2, Crx, Optx2, and FaxL2[75-86]. The expression of Pax6 is upregulated by Six3 and down regulated by Shh (Sonic hedgehog). It assists in eye formation on both sides. The transcription factor Pax2 is important for the formation of the optic stalk (which becomes the optic nerve). Retinal axons from both the eyes selectively decussate at the midline named optic chiasma (crucial for vision) which is failed when the Pax2 mutates (optic chiasma). AIPL1 gene mutation is responsible for Leber’s congenital amaurosis (LCA), early-onset of retinal degeneration, retinitis pigmentosa (RP) and cone-rod dystrophy. Adeno-associated virus (AAV)-mediated gene replacement therapy in mice models could restore PDE biosynthesis in rods and cones and thereby improve photoreceptor survival. Gene therapy is also applied to treat retinitis pigmentosa and Leber congenital amaurosis caused by defects in AIPL1. Gene therapy is used to cure retinal degenerative disease and optic nerve regeneration and diagnostics. The neural ectodermal derivatives of eye are permanent cells and lack the self-renewal, as like other nervous tissues. But unlike other surface ectodermal derivatives, the ocularectodermal derivatives do lack the self-renewal in the eye during aging which collectively results in various degenerative disorders (Figure 1). Nanomedicines are provided to the patients suffering from retinal and optic nerve diseases. It works as trophic factor therapy for glaucoma, retinal degenerative, and retinal vascular disease. It is also applied for ophthalmic problems; such as multiple sclerosis (MS) is typically characterized by inflammation and demyelination leading to neuro-degeneration. Mucopolysaccharidosis I (MPS I) is an inherited metabolic disorder resulting from deficiency of α-L-iduronidase and lysosomal accumulation of glycosaminoglycans (GAG) in multiple tissues. Accumulation of GAG in corneal stromal cells causes corneal opacity and reduced vision. Ocular GAG accumulation can be effectively treated by intravenous enzyme replacement therapy (ERT). This therapy effectively prevents and/or clears corneal stromal GAG accumulation. Progressive multiple sclerosis is associated with metabolic failure of the axon and excite toxicity that leads to chronic neuro-degeneration. Global sodium-channel blockade causes side effects that can limit its use for neuroprotection in multiple sclerosis. CFM6104 significantly slowed down the accumulation of disability and nerve loss in experimental autoimmune encephalomyelitis. Therapeutic-targeting of drugs to lesions may reduce the potential side effect profile of neuroprotective agents that can influence neurotransmission. This class of agents inhibits microglial activity and neural sodium loading. It is responsible for progressive neuro-degeneration in multiple sclerosis and possibly other neurodegenerative diseases. A series of imidazol-1-ylethylindazole sodium channel ligands were developed and optimized for sodium channel inhibition and in vitro neuroprotective activity. The molecules exhibited displacement of a radio labeled sodium channel ligand and selectivity for blockade of the inactivated state of cloned neuronal Nav channels. For treatment of neuro-optic defects like optic nerve atrophy and progressive vision loss intravenous injection (IV), Lumber Puncture (LP) and Retrobulbar (RB) injections of drug are provided. These drugs reduce intraocular pressure (IOP). Intravitreal injections of anti-VEGF antibodies and corticosteroids or laser photocoagulation are used to treat vascular leakage and macular oedema. Glaucoma can be cured by long-term pharmacological management by self-administered drugs. But sometimes these treatments cause undesirable side effects and do not resolve the fundamental pathology. Any defect in sensory nerve supply obstructs vision. However, for successful innervation signaling pathways between nerves and their target tissue must fully known. c-Jun expression is important for surviving and regenerating retinal ganglion cells. Complications in the posterior eye segment in patients can be removed by using allogeneic hematopoietic stem cell transplantation (HSCT) (stem cells collected from a matching donor’s blood or marrow and grow in the patient’s marrow). Traumatic optic nerve injury occurs due to severe inflammation and/or ischemia that are curable by using therapeutic strategies (Figure 4). 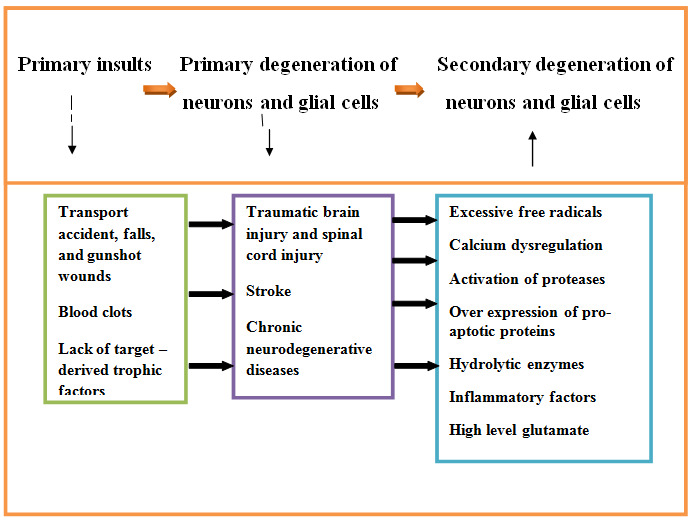 Figure 4: Showing physiological factors responsible for occurrence of neurodegenerative diseases. Tissue bioengineering has made advancement in biomaterial cell scaffolds and generated biological devices engineered tissue substitutes that assist in providing controllable environments. These generate impetus to surrounding tissue and innervate neural system. There are established stem cells therapies which become a realistic option for treating multiple eye diseases. Bio-engineered human corneal substitutes promote nerve in-growth in a pattern similar to in vivo re-innervation. Though there remain some difficulties regarding immune rejection of corneal transplantation. These bioengineered corneas (BPCs) meet out shortage of donor corneas for transplantation and attribute near about similar transparency and compatibility to natural corneas. BPCs (bioengineered prosthetic corneas) fabricated into hydrogel corneal implants provide over 90% transparency and four-fold increase in strength and stiffness compared with previous versions. These tissue engineered corneal transplantations have shown very high success to treat blinding diseases. Further, bioengineering technology has evolved new scaffolds/biomaterials which are used in reconstructing corneal epithelium. Engineered human corneal substitutes promote nerve in-growth in a pattern similar to in vivo re-innervation. Bio-artificial nerves are morphologically equivalent to natural corneal nerves. These could also make appropriate contact with target cells, generate action potentials. These can respond to chemical and physical stimuli and play an important role in the overall functioning of the eye if transplanted properly. To facilitate the axons regeneration of central nervous system after injury PI3K/AKT/mTOR signaling pathway via deleting phosphatase and tensin homolog (PTEN) is to be activated. It successfully enhances intrinsic growth capacity of neurons. Mobile zinc increases rapidly in the retina after optic nerve injury and regulates ganglion cell survival and optic nerve regeneration. If any how dysregulation of mobile zinc (Zn2+) in retinal interneurons is done to tackle with optic nerve is injury. Zn2+ chelation is used as a strategy to promote long-term RGC protection and enhance axon regeneration. Zn2+ accumulation in amacrine cell processes involves the Zn2+ transporter protein ZnT-3, and deletion of slc30a3, the gene encoding ZnT-3, promotes RGC survival and axon regeneration. However, for prompt protection of vision and preventing visual impairment early diagnosis using various methods of intervention such as surgery, ionizing radiation, laser, or drug treatments is most essential step. Though, all such treatment methods do not provide a complete solution to stop the progression to blindness. Other category of treatment is use of alternative medicine that perpetuates the practice of injecting animal materials in an attempt to cure disease, but it is also found obscured in some cases. Traumatic nerve injury can be improved by axonal regeneration of RGCs, use of cytokines and their downstream signaling pathways and intrinsic growth program and extracellular environment should maintain. Tyrosine-mutated AAV2-mediated shRNA silencing of PTEN promotes axon regeneration of adult optic nerve. Netrin-1 a protein molecule performs chemotropic function and provides axonal guidance, cell migration, morphogenesis and angiogenesis. Netrin-1 receptors are expressed in Schwann cells, the cell bodies of sensory neurons and the axons of both motor and sensory neurons. Netrin-1 plays a positive role in promoting peripheral nerve regeneration, Schwann cell proliferation and migration. Furthermore, peripheral nerve (PN) sheaths are reconstructed by using adult Schwann cells (SCs). These are grafted onto the optic nerve that supports the regeneration of injured adult rat retinal ganglion cell (RGC) axons. Antiviral-mediated transfer of CNTF to Schwann cells also done within reconstructed peripheral nerve grafts. It enhances adult retinal ganglion cell survival and axonal regeneration (Figure 1). Hydrated collagen and N-isopropylacrylamide copolymer-based ECMs are fabricated. These are used in replacement therapy to improve nerve function mainly regeneration of defective neurons. Extracellular matrix (ECM) macromolecules replicate within tissue-engineered biosynthetic matrices and influence cellular properties and behavior. MSCs growth inducing macromolecules, cytokines and humor are used to treat retinal detachment cases. These are used to treat fibrovascular scarring in ARMD, DR, ROP, and neovascular glaucoma and restoration of retinal function. MSCs could also neutralize reactive oxygen species in injured eye tissue and secrete various cytokines and growth factors including hepatocyte growth factor (HGF), interleukin 10, and adrenomedullin showed anti-fibrotic properties. Diabetic retinopathy and hypoxia provoke the release of inflammatory cytokines and are responsible for leakage of blood vessels and functionally put negative effect on optics. Cell replacement therapies are used for retinal repair, although there are considerable serious issues such as optic neuritis, various neuropathies, optic nerve hypoplasia, glaucoma, scleritis, retinal neurodegenerative diseases (Table 1) to overcome, including the differentiation and integration of the transplanted cells. Cell replacement is a novel therapeutic approach to restore visual functions and restore degenerated adult neurons. There are so many methods developed which show incremental improvement in visual function such as transplanted RGCs can integrate into the mature retina and help in restoration of vision. Cell transplantation to replace lost photoreceptors is a potential therapeutic strategy. Cells that have the capacity to release soluble factors such as cytokines, chemokines, and growth factors facilitate self-healing of the organ or region. These cells remain viable for a relatively short period but induce cell proliferation and tissue repairing mechanism. Stem cell differentiation can generate cells needed for replacement or can be used to generate cells capable of secreting protective factors to promote survival. But there are several risks after injections into posterior compartments of eye. Stem cells such as induced pluripotent stem cells (iPSCs) intervention can bring significant improvements in the vision quality, vision acuity and ease of pain. Gene therapy is also used to restore biological functions in both rods and cones to rescue retinal degeneration caused by mutations. Though stem cell therapy is quite curable but it raises many ethical issues regarding removing of cells or ocular tissue from human fetuses. New important area of research related to vision is childhood visual impairment and cerebral visual impairment. There is a need for development of novel cell replacement therapies for treatment like optic nerve cell transplantation, induced pluripotent stem cells, retinal ganglion cells, bone marrow mesenchymal stem cells of optic nerve disorders which are considered untreatable. No doubt engineered tissue substitutes and stem cell transplantations can treat optic nerve pathologies. These could provide controllable environments for regeneration of nerve cells, adjoining photoreceptors and restore visual system network. But it will need quick diagnostics, therapies, biocompatible tissues, and devices to enhance visual system circuitry and network responses. 1. Peng, Y., Zhang, Y., Huang, B., et al. Survival and migration of pre-induced adult human peripheral blood mononuclear cells in retinal degeneration slow (rds) mice three months after subretinal transplantation. (2014) Curr Stem Cell Res Ther 9(2): 124-133. 2. Al-Izki, S., Pryce, G., Hankey, D.J., et al. Lesional-targeting of neuroprotection to the inflammatory penumbra in experimental multiple sclerosis. (2014) Brain 137(Pt1): 92-108. 3. Türkyılmaz, K., Öner, V., Türkyılmaz, A.K., et al. Evaluation of peripapillary retinal nerve fiber layer thickness in patients with vitamin B12 deficiency using spectral domain optical coherence tomography. (2013) Curr Eye Res 38(6): 680-684. 4. Karnati, R., Talla, V., Peterson, K., et al. Lacritin and other autophagy associated proteins in ocular surface health. (2016) Exp Eye Res 144: 4-13. 5. Sun, X., Pawlyk, B., Xu, X., et al. Gene therapy with a promoter targeting both rods and cones rescues retinal degeneration caused by AIPL1 mutations. (2010) Gene Ther 17(1): 117-131. 6. Zarbin, M.A., Montemagno, C., Leary J.F., et al. Nanomedicine for the treatment of retinal and optic nerve diseases. (2013) Curr Opin Pharmacol 13(1): 134-148. 7. Li, H.J., Sun, Z.L., Yang, X.T., et al. Exploring optic nerve axon regeneration. Curr Neuropharmacol Dec 27 [Epub ahead of print]. 8. Riordan-Eva, P. Clinical assessment of optic nerve disorders. (2004) Eye 18(11): 1161–1168. 9. Bull, N.D., Martin, K.R. Concise review: toward stem cell-based therapies for retinal neurodegenerative diseases. (2011) Stem Cells 29(8): 1170–1175. 10. Burton, T.C. Recovery of visual acuity after retinal detachment involving the macula. (1982) Transactions of the American Ophthalmological Society 80: 475–497. 11. Ross, W.H. Visual recovery after macula-off retinal detachment. (2002) Eye 16(4): 440-446. 12. Bourne, R.R., Jonas, J.B., Flaxman, S.R., et al. Prevalence and causes of vision loss in high-income countries and in Eastern and Central Europe: 1990–2010. (2014) British Journal of Ophthalmology 98(5) 629-638. 13. Vassilev, Z.P., Ruigómez, M., Rodŕıguez, L.A. Diabetes, cardiovascular morbidity, and risk of age-related macular degeneration in a primary care population. (2015) Investigative Ophthalmology and Visual Science 56(3): 1585–1592. 14. Cheng, C.Y., Yamashiro, K., Chen, L.J., et al. New loci and coding variants confer risk for age-related macular degeneration in East Asians. (2015) Nature Communications 6: 6063. 15. Akhtar, S., Ahmed, A., Randhawa, M.A., et al. Prevalence of vitamin A deficiency in South Asia: causes, outcomes, and possible remedies. (2013) Journal of Health Population and Nutrition 31(4): 413–423. 16. Yu, X., Lyu, D., Dong, X., et al. Hypertension and risk of cataract: a meta-analysis. (2014) PLoS ONE 9 (12): e114012. 17. Sayin, N., Kara, N., Pekel, G. Ocular complications of diabetes mellitus. (2015) World Journal of Diabetes 6(1): 92–108. 18. Ye, J., He, J., Wang, C., et al. Smoking and risk of age-related cataract: a meta-analysis. (2012) Invest Ophthalmol Vis Sci 53(7): 3885–3895. 19. Thylefors, B., Negrel, A.D., Pararajasegaram, R., et al. Global data on blindness. (1995) Bull World Health Organ 73(1): 115–121. 20. Nishino, S., Okuro, M., Kotorii, N., et al. Hypocretin/orexin and narcolepsy: new basic and clinical insights. 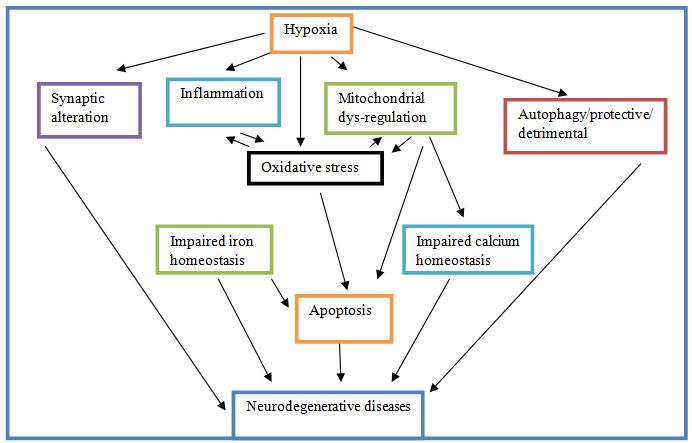 (2010) Acta Physiol (Oxf) 198(3): 209-222. 21. Scholl, H.P., Thiel, H.J., Schlote, T. Orbital hemorrhage as a sequela of heparin-induced thrombocytopenia. (1999) Klin Monbl Augenheilkd 215(3): 197-200. 22. Jonas, J.B., George, R., Asokan, R., et al. Prevalence and causes of vision loss in central and south Asia: 1990–2010. (2014) Br J Ophthalmol 98(5): 592–598. 23. Quigley, H., Broman, A.T. The number of people with glaucoma worldwide in 2010 and 2020. (2006) Br J Ophthalmol 90(3): 262–267. 24. Jonas, J.B., Kamppeter, B.A., Harder, B.U., et al. Intravitreal triamcinolone acetonide for diabetic macular edema: a prospective, randomized study. (2006) Br J Ophthalmol 22(3): 200–2076. 25. Levin, L.A., Miller, J.W., Zack, D.J., et al. Special Commentary: Early Clinical Development of Cell Replacement Therapy: Considerations for the National Eye Institute Audacious Goals Initiative. (2017) Ophthalmology 124(7): 926-934. 26. Jonas, J.B., Kamppeter, B.A., Harder, B., et al. Intravitreal triamcinolone acetonide for diabetic macular edema: a prospective, randomized study. (2006) J Ocul Pharmacol Ther 22(3): 200–207. 27. Hou, H.Y., Liang, H.L., Wang, Y.S., et al. A therapeutic strategy for choroidal neovascularization based on recruitment of mesenchymal stem cells to the sites of lesions. (2010) Molecular Therapy 18(10): 1837–1845. 28. Stahl, A., Smith, L.E.H. An eye for discovery. (2010) J Clin Invest 120(9): 3008–3011. 29. Mok, P.L., Leong, C.F., Cheong, S.K. Cellular mechanisms of emerging applications of mesenchymal stem cells. (2013) Malays J Pathol 35(1): 17–32. 30. Achyut, B.R., Varma, N.R., Arbab, A.S. Application of umbilical cord blood derived stem cells in diseases of the nervous system. (2014) J Stem Cell Res Ther 4(202). 31. Kumar, S.S., Alarfaj, A.A., Munusamy, M.A., et al. Recent developments in β-cell differentiation of pluripotent stem cells induced by small and large molecules. (2014) Int J Mol Sci 15(12): 23418–23447. 32. Chen, T., Wang, F., Wu, M., et al. Development of hematopoietic stem and progenitor cells from human pluripotent stem cells. (2015) J Cell Biochem 116(7): 1179–1189. 33. Matsuo, T. Vision engineering-photoelectric dye-based retinal prostheses: Okayama University model. (2007) Brain Nerve 59(4): 331-338. 34. Schmeer, C.W., Wohl, S.G., Isenmann, S. Cell-replacement therapy and neural repair in the retina. (2012) Cell Tissue Res 349(1): 363-374. 35. Osakada, F., Hirami, Y., Takahashi, M. Stem cell biology and cell transplantation therapy in the retina. (2010) Biotechnol Genet Eng Rev 26: 297-334. 36. Lu, Q., Cui, Q., Yip, H.K., et al. c-Jun expression in surviving and regenerating retinal ganglion cells: effects of intravitreal neurotrophic supply. (2003) Invest Ophthalmol Vis Sci 44(12): 5342-5348. 37. Quigley, H.A. Neuronal death in glaucoma. (1999) Prog Retin Eye Res 18(1): 39-57. 38. Jones, M.K., Lu, B., Girman, S., et al. Cell-based therapeutic strategies for replacement and preservation in retinal degenerative diseases. (2017) Prog Retin Eye Res 58: 1-27. 39. Goureau, O., Sahel, J.A. Retinal stem cells: mechanism of differentiation and therapeutic application. (2006) Pathol Biol (Paris) 54(2): 64-71. 40. Aoki, H., Hara, A., Niwa, M., et al. An in vitro mouse model for retinal ganglion cell replacement therapy using eye-like structures differentiated from ES cells. (2007) Exp Eye Res 84(5): 868-875. 41. Tassoni, A., Gutteridge, A., Barber, A.C., et al. Molecular Mechanisms Mediating Retinal Reactive Gliosis Following Bone Marrow Mesenchymal Stem Cell Transplantation. (2015) Stem Cells 33(10): 3006-3016. 42. Pearson, C., Martin, K. Stem cell approaches to glaucoma: from aqueous outflow modulation to retinal neuroprotection. (2015) Prog Brain Res 220: 241-256. 43. Sluch, V.M., Zack, D.J. Stem cells, retinal ganglion cells and glaucoma. (2014) Dev Ophthalmol 53: 111-121. 44. Barber, A.C., Hippert, C., Duran, Y., et al. Repair of the degenerate retina by photoreceptor transplantation. (2013) Proc Natl Acad Sci U S A 110(1): 354-359. 45. Simons, B.D., Clevers, H. Strategies for homeostatic stem cell self-renewal in adult tissues. (2011) Cell 145(6): 851–862. 46. Hwang, N.S., Varghese, S., Elisseeff, J. Controlled differentiation of stem cells. (2008) Advanced Drug Delivery Reviews 60(2): 199–214. 47. Seita, J., Weissman, I.L. Hematopoietic stem cell: self-renewal versus differentiation. (2010) Wiley Interdiscip Rev Syst Biol Med 2(6): 640–653. 48. Mead, B., Berry, M., Logan, A., et al. Stem cell treatment of degenerative eye disease. (2015) Stem Cell Res 14(3): 243-257. 49. Howell, N., Kubacka, I., Xu, M., et al. Leber hereditary optic neuropathy: involvement of the mitochondrial ND1 gene and evidence for an intragenic suppressor mutation. (1991) Am J Hum Genet 48(5): 935-942. 50. Stanzel, B.V., Liu, Z., Somboonthanakij, S., et al. Human RPE stem cells grown into polarized RPE monolayers on a polyester matrix are maintained after grafting into rabbit subretinal space. (2014) Stem Cell Reports 2(1): 64-77. 51. Al-Shamekh, S., Goldberg, J.L. Retinal repair with induced pluripotent stem cells. (2014) Transl Res 163(4): 377-386. 52. Zwart, I., Hill, A.J., Al-Allaf, F., et al. Umbilical cord blood mesenchymal stromal cells are neuroprotective and promote regeneration in a rat optic tract model. (2009) Exp Neurol 216(2): 439-448. 54. Johnson, D.W., Cagnoni, P.J., Schossau, T.M., et al. Optic disc and retinal microvasculopathy after high-dose chemotherapy and autologous hematopoietic progenitor cell support. (1999) Bone Marrow Transplant 24(7): 785-792. 55. Hertsenberg, A.J., Shojaati, G., Funderburgh, M.L., et al. Corneal stromal stem cells reduce corneal scarring by mediating neutrophil infiltration after wounding. (2017) PLoS One 12(3): e0171712. 56. Stavropoulos, M.E., Mengarelli, I., Barberi, T. Differentiation of multipotent mesenchymal precursors and skeletal myoblasts from human embryonic stem cells. (2009) Curr Protoc Stem Cell Biol Chapter 1: Unit 1F.8. 57. Du, Y., Roh, D.S., Mann, M.M., et al. stem cells from trabecular meshwork become phagocytic TM cells. (2012) Invest Ophthalmol Vis Sci 53(3): 1566-1575. 58. Joyce, N.C., Harris, D.L., Markov, V., et al. Potential of human umbilical cord blood mesenchymal stem cells to heal damaged corneal endothelium. (2012) Mol Vis 18: 547-564. 59. Bray, L.J., Heazlewood, C.F., Munster, D.J., et al. Immunosuppressive properties of mesenchymal stromal cell cultures derived from the limbus of human and rabbit corneas. (2014) Cytotherapy 16(1): 64-73. 60. Yao, L., Li, Z.R., Su, W.R., et al. Role of mesenchymal stem cells on cornea wound healing induced by acute alkali burn. (2012) PLoS One 7(2): e30842. 61. Garfias,Y., Nieves-Hernandez, J., Garcia-Mejia, M., et al. Stem cells isolated from the human stromal limbus possess immunosuppressant properties. (2012) Mol Vis 18: 2087-2095. 63. Greene, C.A., Chang, C.Y., Fraser, C.J., et al. Cells from the adult corneal stroma can be reprogrammed to a neuron-like cell using exogenous growth factors. (2014) Exp Cell Res 322(1): 122-32. 64. Liu, W., Liu Y., Liu, H., et al. Differentiation of adipose-derived mesenchymal stem cells after transfection with Pax6 gene. (2014) Zhongguo Xiu Fu Chong Jian Wai Ke Za Zhi 28(8): 1004-1008. 65. Xie, L.X. Advances in basic and clinical corneal research. (2010) Zhonghua Yan Ke Za Zhi 46(10): 883-887. 66. Erclik, T., Hartenstein, V., McInnes, R.R., et al. Eye evolution at high resolution: the neuron as a unit of homology. (2009) Dev Biol 332(1): 70-79. 67. Espandar, L., Caldwell, D., Watson, R., et al. Application of adipose-derived stem cells on scleral contact lens carrier in an animal model of severe acute alkaline burn. (2014) Eye Contact Lens 40(4): 243-247. 68. Barish, M.E., Herrmann, K., Tang, Y., et al. Human Neural Stem Cell Biodistribution and Predicted Tumor Coverage by a Diffusible Therapeutic in a Mouse Glioma Model. (2017) Stem Cells Transl 6(6): 1522-1532. 69. Hill, A.J., Zwart, I., Samaranayake, A.N., et al. Rat neurosphere cells protect axotomized rat retinal ganglion cells and facilitate their regeneration. (2009) J Neurotrauma 26(7): 1147-1156. 70. Bull, N.D., Martin, K.R. Optic nerve restoration: new perspectives. (2007) J Glaucoma 16(5): 506-511. 71. Matsuo, T. Vision engineering--photoelectric dye-based retinal prostheses: Okayama University model. (2007) Brain Nerve 59(4): 331-338. 72. Junqueira, L.C.U., Mescher, A.L. Junqueira's Basic Histology: Text and Atlas. (2010) 12th New York, USA: McGraw-Hill Medical. 73. Firsova, N.V., Iu, V., Smirnova, A., et al. Identification of the OCT4-pg1 retrogene and NANOG gene expression in the human embryonic eye. (2008) Izv Akad Nauk Ser Biol 2: 134-138. 74. Ho, H.Y., Chang, K.H., Nichols, J., et al. Homeodomain protein Pitx3 maintains the mitotic activity of lens epithelial cells. (2009) Mech Dev 126(1-2): 18-29. 75. Gehring, W.J. The master control gene for morphogenesis and evolution of the eye. (1996) Genes to Cells 1(1): 11–15. 76. Chow, R.L., Altmann, C.R., Lang, R.A., et al. Pax6 induces ectopic eyes in a vertebrate. (1999) Development 126(19): 4213–4222. 77. Tucker, P., Laemle, L., Munson, A., et al. The eyeless mouse mutation (ey1) removes an alternative start codon from the Rx/rax homeobox gene. (2001) Genesis 31(1): 43–53. 78. Furukawa, T., Kozak, C.A., Cepko, C.L. rax, a novel paired-type homeobox gene, shows expression in the anterior neural fold and developing retina. (1997) Proc Natl Acad Sci U S A 94(7): 3088–3093. 79. Zuber, M.E., Gestri, G., Viczian A.S., et al. Specification of the vertebrate eye by a network of eye field transcription factors. (2003) Development 130(21): 5155–5167. 80. Martínez-Morales, J.R., Rodrigo, I., Bovolenta P. Eye development: a view from the retina pigmented epithelium. (2004) BioEssays 26(7): 766–777. 81. Martínez-Morales, J.R., Dolez, V., Rodrigo, I., et al. OTX2 activates the molecular network underlying retina pigment epithelium differentiation. (2003) The Journal of Biological Chemistry 278(24): 21721–21731. 82. Liu, W., Lagutin, O.V., Mende, M., et al. Six3 activation of Pax6 expression is essential for mammalian lens induction and specification. (2006) The EMBO Journal 25(22): 5383–5395. 83. Mathers, P. H., Grinberg, A., Mahon, K. A., et al. The Rx homeobox gene is essential for vertebrate eye development. (1997) Nature 387(6633): 603–607. 84. Novak, A., Guo, C., Yang, W., et al. Function of Rx, but not Pax6, is essential for the formation of retinal progenitor cells in mice. (2000) Genesis 28(3-4): 135–142. 85. Tan, M.H., Smith, A.J., Pawlyk, B., et al. Gene therapy for retinitis pigmentosa and Leber congenital amaurosis caused by defects in AIPL1: effective rescue of mouse models of partial and complete Aipl1 deficiency using AAV2/2 and AAV2/8 vectors. (2009) Hum Mol Genet 18(12): 2099-2114. 86. Zarbin, M.A., Montemagno, C., Leary, J.F., et al. Nanomedicine for the treatment of retinal and optic nerve diseases. (2013) Curr Opin Pharmacol 13(1): 134-48. 87. Bharti, K., Nguyen, M.T.T., Skuntz, S., et al. The other pigment cell: specification and development of the pigmented epithelium of the vertebrate eye. (2006) Pigment Cell Research 19(5): 380–394. 88. Macdonald, R., Barth, K. A., Xu, Q., et al. Midline signaling is required for Pax gene regulation and patterning of the eyes. (1995) Development 121(10): 3267–3278. 89. Carlson, B. M. Human Embryology and Developmental Biology. (2009) 4th Philadelphia, Pa, USA: Mosby/Elsevier. 90. Lidster, K., Jackson, S.J., Ahmed, Z., et al. Neuroprotection in a novel mouse model of multiple sclerosis. (2013) PLoS One 8(11): e79188. 91. Ferrari, S., Ponzin, D., Ashworth, J.L., et al. Diagnosis and management of ophthalmological features in patients with mucopolysaccharidosis. (2011) Br J Ophthalmol 95(5): 613-619. 92. Newkirk, K.M., Atkins, R.M., Dickson, P.I., et al. Ocular lesions in canine mucopolysaccharidosis I and response to enzyme replacement therapy. (2011) Invest Ophthalmol Vis Sci 52(8): 5130-5135. 93. Al-Izki, S., Pryce, G., Hankey, D.J., et al. Lesional-targeting of neuroprotection to the inflammatory penumbra in experimental multiple sclerosis. (2014) Brain 137(Pt 1): 92-108. 94. Browne, L., Lidster, K., Al-Izki, S., et al. Imidazol-1-ylethylindazole voltage-gated sodium channel ligands are neuroprotective during optic neuritis in a mouse model of multiple sclerosis. (2015) J Med Chem 58(8): 3637. 95. Lu, Q., Cui, Q., Yip, H.K., et al. c-Jun expression in surviving and regenerating retinal ganglion cells: effects of intravitreal neurotrophic supply. (2003) Invest Ophthalmol Vis Sci 44(12): 5342-5348. 96. Yoo, Y.S., Na, K.S., Shin, J.A., et al. Posterior eye segment complications related to allogenic hematopoietic stem cell transplantation. (2017) Retina 37(1):135-143. 97. Chung, S., Rho, S., Kim, G., et al. Human umbilical cord blood mononuclear cells and chorionic plate-derived mesenchymal stem cells promote axon survival in a rat model of optic nerve crush injury. (2016) Int J Mol Med 37(5): 1170-1180. 98. Arjamaa, O. Corneal reconstruction by stem cells and bioengineering. (2012) Clin Ophthalmol 6: 1407-1409. 99. Barbaro, V., Ferrari, S., Fasolo, A., et al. Reconstruction of a human hemicornea through natural scaffolds compatible with the growth of corneal epithelial stem cells and stromal keratocytes. (2009) Mol Vis 15: 2084-2093. 100. Huang, Z., Hu, Z., Xie, Liu, Q. Tyrosine-mutated AAV2-mediated shRNA silencing of PTEN promotes axon regeneration of adult optic nerve. (2017) PLoS One 12(3): e0174096. 101. Li, Y., Andereggen, L., Yuki, K., et al. Mobile zinc increases rapidly in the retina after optic nerve injury and regulates ganglion cell survival and optic nerve regeneration. (2017) Proc Natl Acad Sci U S A 114(2): E209-E218. 102. Dun, X.P., Parkinson, D.B. Role of Netrin-1 Signaling in Nerve Regeneration. (2017) Int J Mol Sci 18(3): E491. 103. Hu, Y., Leaver, S.G., Plant, G.W., et al. Lentiviral-mediated transfer of CNTF to schwann cells within reconstructed peripheral nerve grafts enhances adult retinal ganglion cell survival and axonal regeneration. (2005) Mol Ther 11(6): 906-915. 104. Li, H.J., Sun, Z.L., Yang, X.T., et al. Exploring optic nerve axon regeneration. (2016) Curr Neuropharmacol [Epub ahead of print]. 105. Friedlander, M. Fibrosis and diseases of the eye. (2007) The Journal of Clinical Investigation 117(3): 576–586. 106. Jalali, S. Retinal detachment. (2003) Community Eye Health 16(46): 25–26. 107. Jackson, W.M., Nesti, L.J., Tuan, R.S. Mesenchymal stem cell therapy for attenuation of scar formation during wound healing. (2012) Stem Cell Res Ther 3(3): 20. 108. Bunce, C., Xing, W., Wormald, R. Causes of blind and partial sight certifications in England and Wales: April 2007-March 2008. (2010) Eye 24(11): 1692–1699. 109. Kaur, C., Foulds, W. S., Ling, E. A. Blood-retinal barrier in hypoxic ischaemic conditions: basic concepts, clinical features and management. (2008) Prog Retin Eye Res 27(6): 622–647.